Educatall is coming to the rescue with circle time suggestions, workshop ideas, activities for babies and toddlers, outdoor activities, games, and crafts. 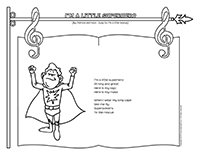 Your little superheroes will love our activity sheets, word flashcards, puzzles, coloring pages, puppets, masks, new song, and so much more! 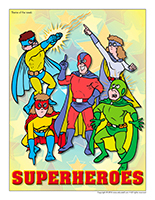 (Open thematic poster-Superheroes) Print, laminate, and decorate the walls of your daycare with all kinds of posters. 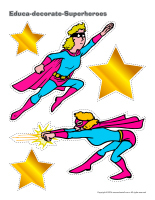 (Open educa-decorate-Superheroes) Print, laminate, and cut out the various items. Use them to decorate your daycare and set the mood for the theme. 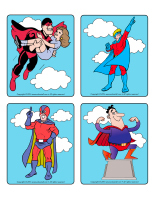 Collect different posters of superheroes children are familiar with and display them on the walls of your daycare. Hang various accessories associated with superheroes from the ceiling to pique children's curiosity as they arrive in the morning. Cut a large star shape out of yellow cardboard or use a large model of your group's logo. 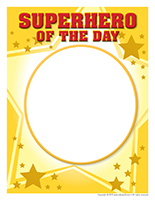 Display it on your daycare door and use it to identify your "superhero of the day". 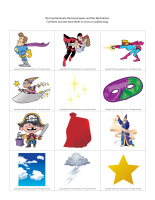 Determine various privileges for your "superhero of the day" with your group and display pictograms to represent each one and help children recognize and anticipate them. What superhero powers would you like to have? Name the superheroes you know. Name an accessory that is used by superheroes. To greet children, wear a unique superhero costume. Keep in mind that children learn most when they are having fun. During circle time, change the spots where children sit. Decorate your circle time area with shiny items to add a touch of magic to your group discussions. Hang stars, tulle, glittery curtains, tiny white Christmas lights, etc. throughout your daycare. Prepare a small surprise for the children in your group and stick glow-in-the-dark stars here and there. Turn the lights off and let them admire the show! Write the name of each child on a star and hang it above his/her spot in your circle time area. (Open model-star) Print and display next to children's artwork. If you wish, use adhesive paper to stick a star on the floor for each child to create a Superhero Boulevard. If possible, create this path where children and parents are sure to see it. If you prefer, hang the stars from the ceiling or on an indoor clothesline. Ask you local video rental store for posters announcing different children's movies and use them to decorate the walls of your daycare. (Open picture game-Superheroes) Use the pictures to decorate your daycare or to spark a conversation with your group. Print, laminate, and store the pictures in a Ziploc bag or in your thematic bin. 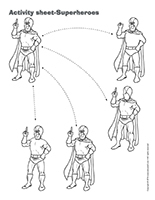 (Open activity sheets-Superheroes) Print and follow instructions. 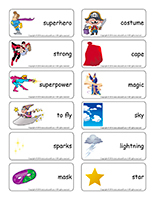 (Open writing activities-S like superhero) Print for each child or laminate for use with a dry-erase marker. (Open stationery-Superheroes) Print. Use the stationery to communicate with parents, in your writing corner, or to identify your thematic bins. 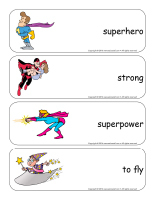 (Open educa-nuudles-Superheroes) Print for each child. Have children color the sheet. Once they are done, they may use Magic Nuudles to turn the coloring pages into three dimensional works of art. Variation: If you do not have Magic Nuudles, ask children to fill the spaces designed for the Magic Nuudles with bingo markers or stickers. To order Magic Nuudles. Blocks of all kinds to which you have added shiny stickers or star shapes wrapped in aluminum paper. Hoops, string, beads, and feathers for making unique dreamcatchers. Glitter that can be used for shiny magical creations. Gel crayons and dark paper for writing, like magic! Black construction paper and a magician's hat model. Cardboard tubes, scraps of paper, and imagination for creating magic wands. Rocks that can be painted to represent magical stones. Use white glue to draw a shape before sprinkling it with glitter. Encourage children to draw what they would like to see appear...like magic! Use flashlights or a black light to draw in the dark. Costume bin: Collect several different costumes (ask parents to share what they have at home with your group) and use them to create a special costume bin that children can explore throughout the theme. Magician's kitchen: Large pots, different ingredients, large spoons, plastic dishes and wine glasses, magic powder (Jell-O), etc. The magician: Magician's hat, black cape or a cape decorated with shiny appliqués, a magic wand, a stuffed rabbit, a bird cage, a deck of cards, etc. Memory game involving magic-related illustrations (store-bought version or use educatall.com picture games). Dark blue or black modeling dough. Add glitter to it! Various card games. Children especially like manipulating oversized cards. Various rigged items for magic tricks. Books about superheroes, magic, or imaginary worlds. Hang tiny lights, tulle, etc. in you reading area to create a magical hideout. Sequential stories with pictures that must be placed in the correct order. Games involving educatall.com word flashcards. Create an obstacle course that children must complete in the dark or throughout which they must collect items associated with magic such as a wand, a hat, a rabbit, a bird, a playing card, etc. Organize a treasure hunt where children must find the ingredients for a magic potion. Parachute games. Children can hide under the parachute to disappear. Activities in the dark with flashlights or glow sticks. Simple magic tricks, juggling, etc. Games involving shadows (objects and/or hands behind a white sheet). A bin filled with colourful marbles. Small container filled with glitter or rocks painted with glow-in-the-dark or shiny paint. Use lemon juice to write secret messages on paper and watch them appear when exposed to the heat of a candle's flame. (Open game-This is my spot-Superheroes) Print two copies of each illustration. Use adhesive paper to stick one copy of each illustration on the table. Place the second copy in a bag. Children take turns picking an illustration to determine where they must sit at the table. You may also use the illustrations to determine children's naptime spots or their place in the task train. 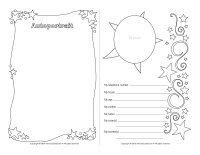 (Open colourful stars-Christmas) Print, laminate, and secure the illustrations on the floor of your daycare to create a path leading to the areas frequently visited by children throughout the day. The path can lead to the bathroom, the cloakroom, etc. If you prefer, use the illustrations to delimit various areas. Provide costumes, hats, scarves, etc. Children will love using the items to dress up like superheroes. If you have a large mirror in your daycare, encourage children to admire their reflection once they are dressed up. Display pictures of children throughout your daycare so they can see themselves here and there as they move around. Help them learn to recognize themselves and their friends, say their name, etc. Place a mirror in front of a child so that he/she can see his/her reflection. Point to the different parts of the child's face, naming each one. Invite children to touch their nose, their eyes, their mouth, their ears, etc. 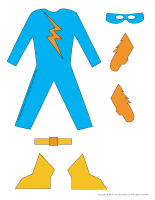 (Open lacing-Superheroes) Print, laminate, and cut out. Encourage children to thread ribbon or string through the holes. Who disappeared under the cape? To the sound of music, children move around the daycare. When the music stops, children must lie down on the floor and hide their eyes with their hands. Hide a child with a blanket (or parachute). When you give them the signal, children must try to identify the child who has disappeared. Just like in "Simon says", give children different instructions. They must perform the various actions only if you say "The superhero says..." first. Otherwise, they must remain perfectly still. Children pretend they are superheroes and participate in a pillow fight...just for fun! Encourage children to walk around the daycare, taking giant steps. With every step, have them make strange sounds. You may also use musical instruments to mark their steps. Give one child a magic wand. He/she must use the wand to transform children. For example, he can decide to turn one child into a table while another child becomes a frog, etc. Children must act out the different items or characters. After a few transformations, give another child the opportunity to be the superhero. Play fast-paced music and invite children to perform various aerobic exercises to the beat in your yard. Invite children to suggest unique moves and exercises. Parachute games are great for developing coordination as well as collaboration among the children in your group. You will find a variety of parachute games on educatall.com. Organize an obstacle course in your yard. Tie a small blanket on each child's shoulders and ask them to complete the course, pretending they are superheroes. Set a small trampoline at the end of the obstacle course. Children can jump on it to fly through the air like their favorite superhero. 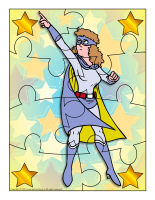 (Open puzzles-Superheroes) Print, laminate, and cut out. Children must place the pieces to recreate the various scenes and superheroes. 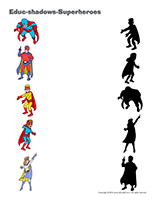 (Open educ-shadows-Superheroes) Print and laminate for durable, eco-friendly use. Children must find the shadow that corresponds to each illustration and connect them using a dry-erase marker. 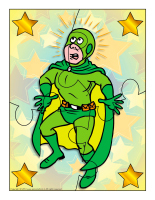 (Open magnifying glass game-Superheroes) Print and laminate the board game and the cards. Store them in a Ziploc bag or in a box. Children pick a card and use a magnifying glass to find the matching illustration on the board game. When they find a match, they deposit the card in the corresponding square, on the board game. Set a variety of different items on the table (magic wand, star, etc.). Encourage children to observe the items for approximately one minute. Hide the objects with a blanket (or cape) and remove one. Children must identify the missing object. Organize a friendly competition within your group. Each family must create their own unique superhero. They can draw their superhero or use arts & crafts material to create a figurine. They must name their superhero and imagine where he/she comes from, what he/she eats, his/her superpowers, etc. before presenting him/her to your group. Invite parents, brothers, sisters, and each child in your group to paint their hands with the color of their choice and make prints on a large banner to create a unique "wall of fame". Decorate your banner with your group and display it on a wall for everyone to see. 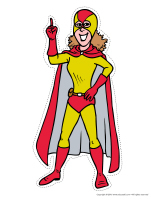 (Open dress-up dolls-Superheroes) Print and laminate. Set the pieces on a table and let children dress up the doll as they wish. 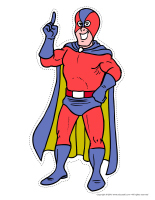 (Open poster-Superhero of the day) Print and display on your daycare door along with the picture of the child who will be your superhero of the day. Throughout the theme, make sure each child has his/her own special day where he/she can share a family photo album, a toy, a CD, a book, or a movie from home with the group. Grant privileges to your superhero of the day (skip naptime, served first, first in line, etc.). Make shadow puppets behind a large white bedsheet hung from the ceiling. Children can represent animals (example: frog) using their entire body or just their hands. If you prefer, cut shapes out of construction paper or cardboard and glue a stick behind each one. Children will love to use these improvised puppets to create shadows. Have children stand in a circle. The superhero of the day sits in the centre of the circle. 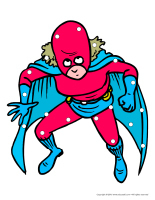 Help children identify various characteristics of the superhero of the day such as the color of his/her eyes and hair, the buttons on his/her sweater, the color of his/her socks, etc. After a few minutes have children draw the superhero of the day individually or as a group on a large paper banner. (Open album about me) Print a copy for each child. Have children draw themselves as they see fit. If you wish, set a mirror in front of each child to help them remember various details. Throughout the theme, complete the album. Children will be proud to take their album home to share it with their family members at the end of the theme. Touch a child with a magic wand on his/her sweater, pant leg, arm, etc. The child must name the piece of clothing that you touched. 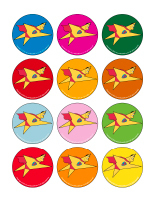 To increase the level of difficulty, you may also ask children to name the color of the corresponding clothing item. Your superhero of the day can request a standing ovation as often as he/she wishes simply by saying, "Since I am a superhero, I would like a standing ovation please." The other children will enjoy stopping what they are doing to applaud the child as loudly as possible. Use a growth chart to measure each child. Compare the results to see who is tallest, shortest, about the same height, etc. Set a variety of different items on a table (nails, paperclips, coins, rubber bands, crayons, blocks, lipstick, etc.). Hold a magnet next to each item, one at a time. Sort the objects into two piles, those that are attracted by the magnet and those that aren't. Fill a large container with flour and add star-shaped confetti or sequins. Children must find as many stars as they can. If you wish, you can also add glitter to the flour for a magical touch. Ask children what their favorite recipes or meals are. You can pick a few to prepare during your theme and even use them to create a special superhero cookbook. You will need different flavors of Jell-O powder (one flavor per child). Each child must add one tablespoon of powder to a bowl. Add hot water and encourage children to take turns stirring until the powder is completely dissolved. Once the mixture is lukewarm, invite them to drink a spoonful of the superpower potion to make them strong like a superhero. 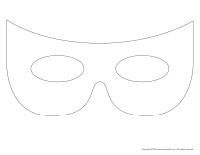 (Open masks-Superheroes) Print and deposit in the centre of the table. Let children create their own superhero masks using the models, crayons, and a variety of arts & crafts materials. When they are done, tie a piece of string on either side of each child's mask and help them tie their mask behind their head. (Open puppets-Superheroes) Print the models on heavy cardboard. Have children cut them out and decorate them with a variety of materials. Glue a Popsicle stick behind each model to create puppets. Encourage each child to create his/her own unique superhero using a variety of materials: cardboard boxes, modeling dough, salt dough, feathers, buttons, pipe cleaners, glitter, scraps of paper, tissue paper, etc. (Open face outline) Print for each child. Ask children to use torn or cut construction paper and markers to represent a superhero's face. If you wish, you could also use a paper plate for this craft. Stick an acetate sheet on a large mirror for each child. Encourage children to draw or paint themselves while looking at their reflection in the mirror, through the acetate sheet. The results will surprise you! Ask children to draw someone they know who they consider to be a hero or just someone they admire a great deal. Display children's drawings on a wall. Have each child lie down on a large piece of paper so you can trace the contour of their silhouette. 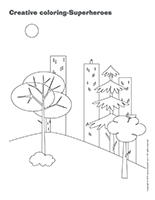 Let children color and decorate their silhouette throughout the theme. Cut different shapes out of colourful construction paper or Fun Foam and set them in the centre of your arts & crafts table. Ask children to use the shapes to represent their home or a superhero's home. If you wish, you can help children learn their home address by adding their street number above the door. (Open model-Magic wand) Print and trace the model on heavy cardboard. Have children cut out the star shape and wrap it with aluminum paper. They must also paint a wooden skewer. If they prefer, they can wrap it in aluminum paper also. Help them glue the skewer behind the star to complete their wand. 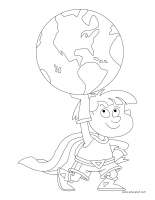 (Open coloring pages theme-Superheroes) Print for each child. 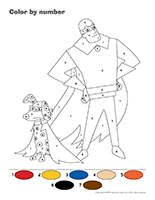 (Open creative coloring-Superheroes) Print for each child. Encourage children to complete the drawing. (Open scrapbook-Superheroes) Print for each child. Add this page to children's scrapbooks once completed. They will have fun drawing the superhero they would like to be.